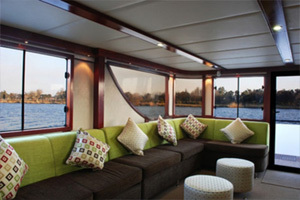 If you are interested in hiring a houseboat on the Vaal River you will not be disappointed. Staying over in a houseboat truly is a unique experience. On the one hand you can view the serene nature scenes stretching all along the banks of the majestic Vaal River, while the houseboat also offers all the facilities that you would expect from such a luxurious overnight accommodation option. Hiring a houseboat such as the Liquid Living or Prive’ Houseboat will offer you a memorable and enjoyable time, which can be spent with friends or a loved-one, or even by yourself if you are looking to escape for a while. Contact us today for more information about our beautiful houseboats and different options available. 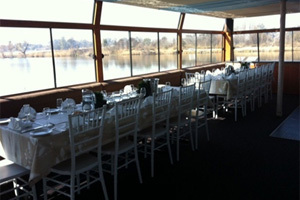 The Vaal River offers a beautiful natural area for visitors from and outside the Vaal area. 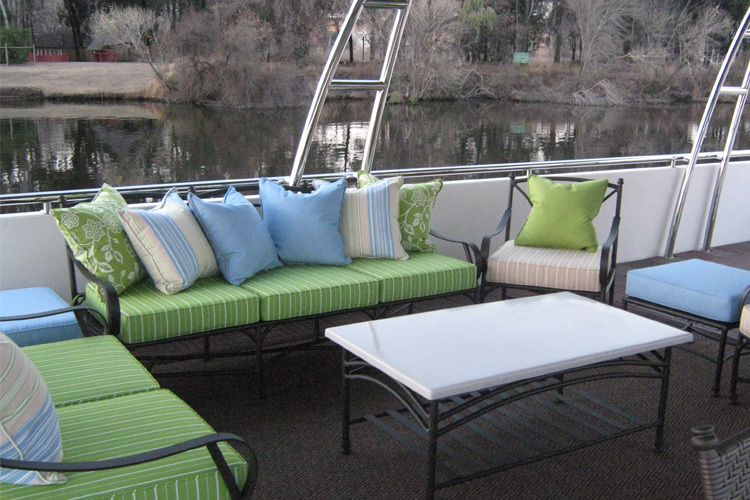 If you are looking to unwind and relax, with or without company, then a stay on a luxurious Vaal River houseboat is for you. Cruise down a calm stretch of navigable river, whilst enjoying a refreshing drink and taking in the beauty and fresh air offered by the natural surrounds. A wide variety of fauna and flora, along with numerous species of fish and birds can also be seen when staying on board our houseboats. Breathtaking sunsets and beautiful stars can be enjoyed on the comfortable sundeck, whilst relaxing with the sounds of nature and water that surrounds you. We offer two accommodation options when it comes to our houseboats, namely Liquid Living and Prive’ Houseboat. 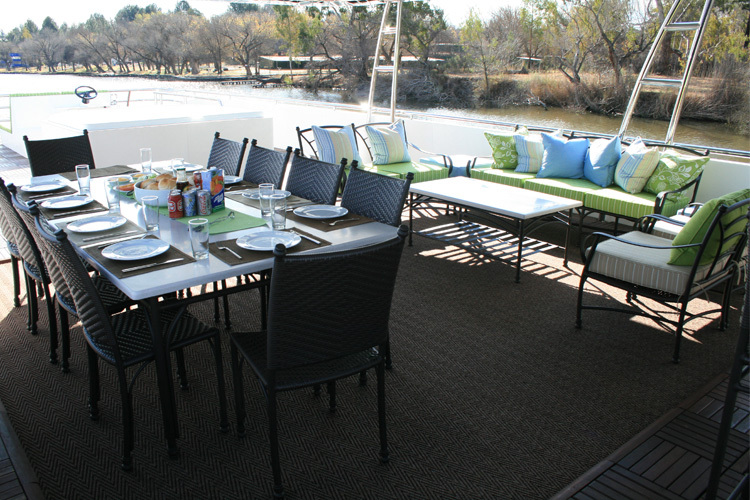 Liquid Living: This Vaal River houseboat boasts beautiful accommodation, and is suitable for 8-10 guests. Enjoy dining on the 10 seat dining room table, while enjoying beautiful views of the Vaal River, or relax in the lounge area, all roof-covered to protect you from the sun. 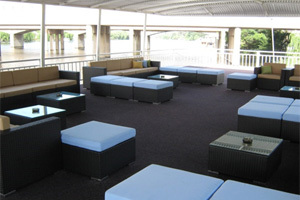 If you’re hoping to catch some sun, the sipping on a cocktail while relaxing in the upper deck Jacuzzi is for you! The Liquid Living houseboat is also equipped with a fully functional kitchen, containing everything you will require during your stay. Various dining and river cruise options are available, contact us for more information about the Liquid Living houseboat today. Prive’ Houseboat: The Prive’ Houseboat is our latest and most exclusive addition to the Liquid Lounge family. This houseboat is permanently moored on a beautiful location of the Vaal River, offering an exclusive stay for a family of four. 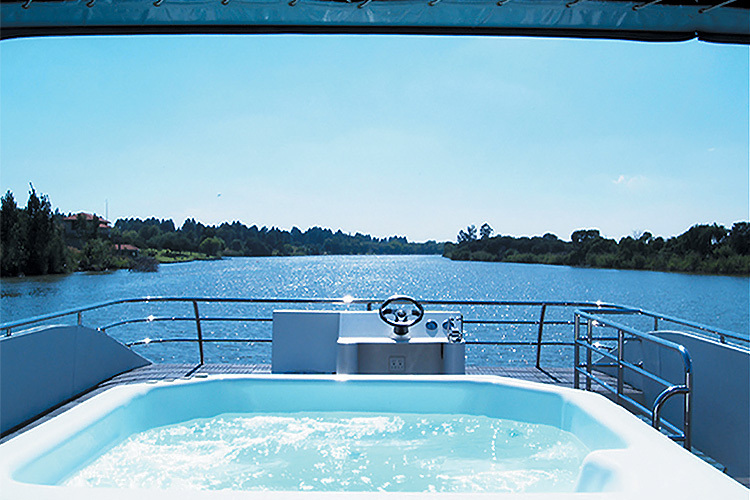 If you are looking for a unique experience in the Vaal Triangle, then the Prive’ Houseboat is for you! This beautiful houseboat offers guests the opportunity to experience nature, while staying in a top accommodation facility equipped with everything you will need. 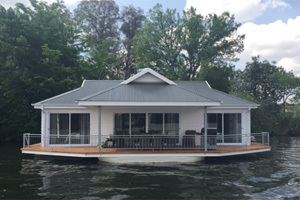 As two of the most popular houseboats for hire on the Vaal River, the Liquid Living and Prive’ Houseboat can provide the perfect balance between being in nature and still enjoying all the comforts that you are accustomed to at a top accommodation facility. From the fully furnished en-suite cabins and the fully functional kitchen with chef preparing breakfast, lunch, dinner and snacks to the entertainment area and the open, upper deck containing Jacuzzis and braai / bar areas, houseboats on the Vaal River such as the Liquid Living and the more private, Prive’ Houseboat, is the perfect opportunity to bring some much needed peace to your soul.